Georgia sophomore quarterback Jake Fromm enters Saturday's SEC championship game ranked third nationally in passing efficiency and with a 23-3 career record as the starter. ATHENS, Ga. — The list of starting quarterbacks with multiple Southeastern Conference championship game victories begins and ends with Florida's Danny Wuerffel. Georgia's Jake Fromm could join that not-so-large contingent Saturday afternoon by guiding the No. 4 Bulldogs (11-1) to an upset of No. 1 Alabama (12-0) in Atlanta's Mercedes-Benz Stadium. Fromm nearly led Georgia past the Crimson Tide in January's national title contest of the 2017 season inside the same building, and the 6-foot-2, 225-pounder has followed his fantastic freshman year by being even more superb as a sophomore. "I know what's going on," Fromm said. "I know the trip to Atlanta, and I know what the environment is going to be like. Playing in big games is fun. It's what you dream of, so let's go out and let's go get it." Wuerffel was Terry Dean's backup in Florida's 1993 SEC title-game win over Alabama before guiding the Gators to three more league crowns, and the only two quarterbacks since who had a chance to defend a conference crown but came up short were Georgia's David Greene and Florida's Tim Tebow. Fromm completed 16 of 22 passes for 183 yards and two touchdowns in last December's 28-7 triumph over Auburn, but he wasn't quite as efficient a few weeks later against the Crimson Tide, going 16-of-32 for 232 yards with a touchdown and two interceptions. "He's got more confidence now, and I think he's comfortable with things," Bulldogs third-year coach Kirby Smart said. "He knows where people are. He knows the protections better. He's got a trust in an offensive line that has been playing well for him, and he also has a run game that he is able to rely on. "If things get hairy, he's able to put in the right run and make it a positive play, so he's staying away from lost-yardage plays." 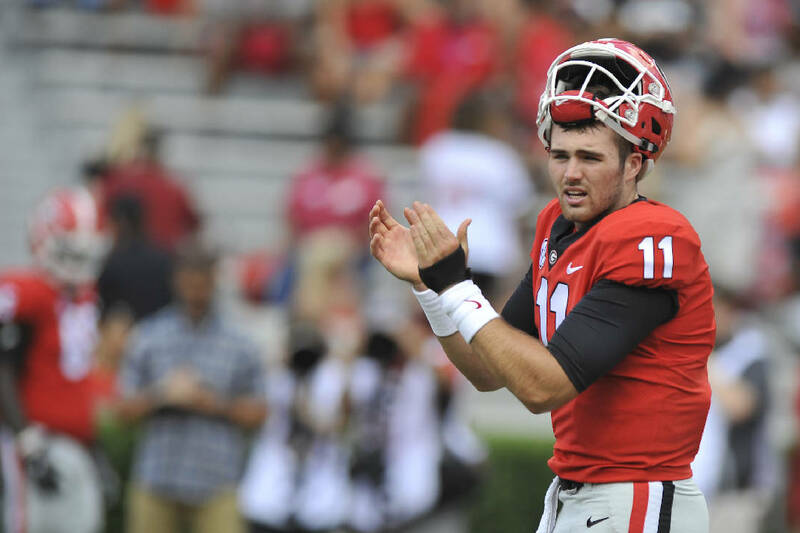 The Bulldogs averaged 35.4 points per game last season and are currently at a 40.1-point clip, with Fromm having completed 161 of 233 passes for 2,236 yards with 24 touchdowns and five interceptions. He already has matched his touchdown total from last season, and his 69.1-percent completion accuracy is on pace to eclipse Hutson Mason's single-season school record of 67.9 in 2014. In his last two games alone, Fromm went 5-for-5 passing in the 66-27 shellacking of UMass and started 7-for-7 in last Saturday's 45-21 hammering of Georgia Tech before winding up 13-of-16 for 175 yards and four scores. "Jake does a great job of managing their offense," Alabama coach Nick Saban said. "He's very accurate and very poised in the way he executes, and he's got a lot of confidence in the system and scheme and does a good job of helping all the skill players that they have make plays, whether it's running or throwing." Fromm ranked ninth nationally in efficiency (160.1) last season and is currently third (179.4), but he will be second in the building Saturday behind Alabama counterpart Tua Tagovailoa, who has racked up 36 touchdowns and only two interceptions for a nation-leading clip of 212.5. Tagovailoa and Fromm began their college careers as backups to Jalen Hurts and Jacob Eason, but Fromm became the starter midway through the first quarter of last year's opener against Appalachian State when Eason sustained a knee injury. Tagovailoa didn't take over from Hurts until halftime of January's title game, but he made the most of it by rallying the Crimson Tide from a 13-0 deficit to a 26-23 overtime triumph. "Me and Tua are really good friends," Fromm said. "He's an awesome competitor, a great football player and a great follower of Jesus. We met during the Elite 11 process when we were seniors in high school, and it kind of took off from there." Fromm added that Saturday's competing quarterbacks talked during the offseason and attended the same camp in May but have not spoken recently. The two are linked not only by their sophomore status, January's encounter and this week's showdown, but they are quite adept at racking up victories. Fromm has a 23-3 mark as Georgia's starter, while Tagovailoa is 12-0 since replacing Hurts, who was 26-2. "I think it comes down to the kind of offenses we run and getting it to great playmakers," Fromm said of the duo's success. "Obviously our coaches are putting us in good situations."